There are many ways to fight Hellhounds, and in fact, you can use any style you want on them! 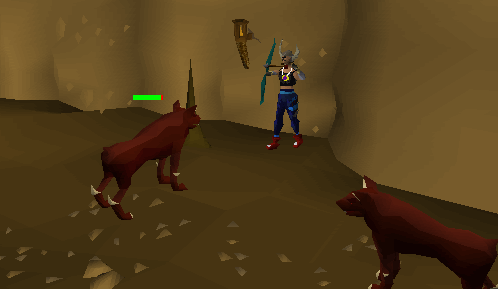 Hellhounds are found in Taverley Dungeon, located west of Falador and south of Taverley. You can also find them in the Ardougne Perfect Gold Dungeon and deep in the Wilderness. You need to go past many monsters before you reach the hounds, and this guide will detail what you will need, and how to fight them. The first area we will cover for hunting Hellhounds is the Taverley Dungeon. The entrance to this dungeon is located a short distance south of the druid town of Taverley. You can use Lobsters, Monkfish and Sharks for food. You can also take Guthans for its Special Ability, or Bones to Peaches Tablets. The Super Attack and Strength Potions are for fast and more efficient training. The Dragon Dagger is for it's special attack which helps you take down the Hounds faster. The Dusty Key is so that you can enter the locked gate in the area with the Lesser Demons. To obtain a key: Go south of the Chaos Dwarves and past the Hill Giants. Go into the Black Knights Lair and east of the room after the door is a jail. Kill the Jailer and get his key. Unlock the jail and talk to the Explorer. Ask him if he knows anywhere to explore and he will give you a Dusty Key. Go back to the place with the Lesser Demons and use the Dusty Key on the door. This will take you to the Blue Dragons. You can also get a Key after passing the Blue Dragons and near the Lava Eels fishing spot. Teleport runes are for quick banking. You don't need them as you are free to use a Home Teleport spell which costs no runes, but requires a 30 minutes recharge time, but can be in case you are in for some serious training. The Halberd can be swapped with another piece of food or, if you are planning on killing the Hounds after you run out of food, you can switch to it and start safe-spotting them. For rangers, you can pretty much have exactly the same inventory, changing the dragon battle-axe for food or a Range Potion. 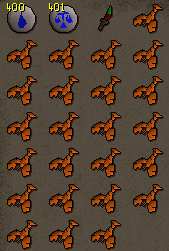 The runes are up to you, and depend on what type of spell you wish to use on the Hellhounds. Helmet: A Black mask is very helpful if you are fighting the Hounds for a Slayer Task. The Mask gives a 15% increase in Attack and Strength against the monster you are assigned to slay. Can be replaced by a Rune, Dragon, Barrow, or Neitiznot helmet. Torso: Rune. Can be swapped with a Bandos Chestplate or Fighters Torso for extra strength bonus, or Barrows armour. Legs: Dragon. The prices of dragon had dropped dramatically (as of the 11 June 2008) and can be used with out fear of damaging your pocket too much money-wise. If you don't want to try you luck you can use Rune. Bandos Tassets, Dragon or Barrows can also be used. Weapon: Abyssal Whip. Can be swapped for a Dragon Scimitar, Saradomin Sword, any of the Godswords or a Barrows Weapon. Shield: Obsidian Shield. Can be swapped for a Defender or a Dragonfire Shield. Boots: Dragon. Can be swapped for Rune or Bandos. Gloves: Gloves obtained from Recipe for Disaster. 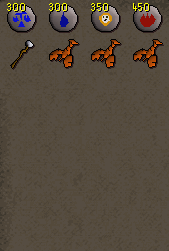 Can be swapped for the Fist of Guthix metal Gauntlets. Ring: You can use a Ring of Wealth for improved chances of a drop or a Berserker ring. Amulet: Strength. Can be swapped for a Glory or Fury. Cape: Legends. Can be swapped for a Fire Cape, Cape of Achievement or Obsidian Cape. Helmet: Blue Mystic Hat. This can be swapped for any other color from the Mystic set. Or can be replaced with Ahrim's Hood if you can afford it and have 70 Defence and Magic. It also can be replaced by an Infinity Hat or 3rd Age. Torso: Blue Mystic Top. Can be replaced by the other Mystics, Ahrim's Robe Top or Infinity Robe Top. Legs: Blue Mystic Bottoms. 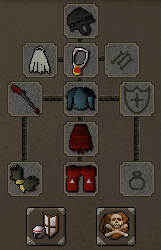 Can be replaced by other Mystic, Ahrim's Robe Skirt or Infinity Robe Bottoms. Weapon: Air Staff. This is for a no Air trip. If you have loads of Airs and less of another, you can swap the staff around to suit the spell. Ancient Mage could be done here, but it would really be a waste of runes. Shield: Guthix book of Balance. It can be replaced by a Saradomin Holy Book or Zamorak Unholy Book. Boots: Blue Mystic Boots, can be replaced by other Mystic, or Infinity Boots. 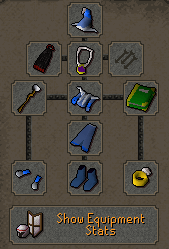 Gloves: Blue Mystic Gloves, can be replaced by other Mystic or Infinity Gloves. 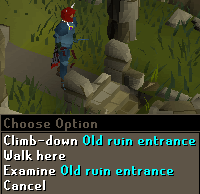 Ring: Ring of Life is recommended because if you get too low in health, you will get teleported straight to Lumbridge or Falador depending on what you set it to. 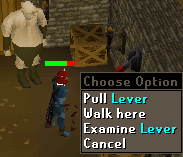 Note: Falador can only be a near death teleport once you complete the Recruitment Drive Quest. Amulet: Amulet of Glory, if you don't have one, you can easily make an Amulet of Magic by using the Crafting and Magic skills. Cape: Obsidian Cape can be used or if not, God capes can be used. 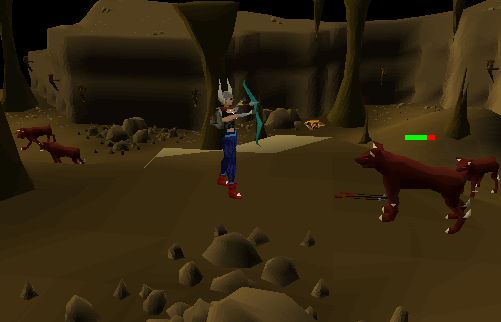 You should have at least 60 Range before attempting to range Hellhounds. Helmet: Archer Helmet This can be changed to a Robin Hood Hat or can be left blank. Torso: Blue Dragonhide Body. It can be changed to another Dragonhide. Legs: Blue Dragonhide Chaps. It can be changed to another Dragonhide. Arrows: If you are using a Magic Bow of any kind, any arrows are good. Above steel is recommended. Weapon: Magic Shortbow. Can be swapped for Crystal or Magic Longbow, or a Yew or Magic Composite Bow. Shield: Nothing. If using a cross-bow, any shield with good range bonus is good. Gloves: Anything that has good range bonus is good. Spiky Vambraces are a good choice, as they give a better Defence bonus and a 1+ Strength bonus. Amulet: Amulet of Glory, Accuracy or Fury. Cape: Cape of Legends, Obsidian or a Skill Cape. After completing Animal Magnetism, Ava gives you her own little device called "Ada's Device." This gives you certain arrows over a period of time. Helmet: Archer Helmet. For a higher range bonus, a God Coif or Robin Hood Hat may be used. Arrows: Steel or Mithril arrows. Weapon: Magic Shortbow or a Crystal Bow. Iron Knives are also a good choice. Shield: If using Iron knives as your weapon, use a completed Unholy Book for +8 range attack bonus, or a Book of Balance for +4 to Ranged Defence and attack. Boots: Boots of Lightness to decrease time taken to run to Hellhounds, or also Snakeskin or Ranger Boots for faster kills. 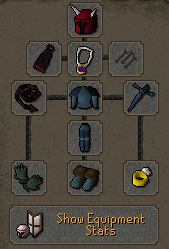 Gloves: Barrows Gloves. Can be obtained from the Recipe for Disaster chest after completion of the quest. 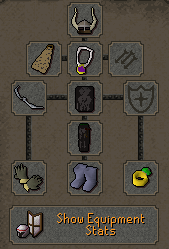 If you do not have access to these gloves, use the best Recipe for Disaster gloves you have access to, or the highest level Dragonhide vambraces you can wear, depending on the range bonus. Ring: Ring of Duelling or Archer Ring. Amulet: Amulet of Glory or an Amulet of Fury. Cape: Cape of Legends, Obsidian Cape, Spotted Cape, Spottier Cape, Skill Cape, Fire Cape, or a God Cape. Preferably a Spotted or Spottier Cape obtainable from the Hunter Skill. This is the "Invisible Line" trick. This is a boundary that the stops the Hellhounds from attacking you. To escape from this evil dungeon you can either teleport or walk out. Bringing runes is not necessary due to the Home Teleport. This takes no runes and sends you straight to Lumbridge. Make sure you are in an un-reachable place so the Hellhounds can't attack you when you try to leave. Hellhounds are level 122 and can easily hit 110s. If you are a low level, it is suggested that you use a Rune or Dragon Halberd. They drop Level 3 Clue scrolls and the four basic charms: Gold, Crimson, Green and Blue. Another easy way to train on your favorite puppies is in the Perfect Gold Dungeon which is part of the Family Crest quest. It is suggested to have a high Defence (60+) if you want to last long here without banking for more food. If you haven't finished Family Crest, you may have to pull the levers you will find throughout the dungeon in a certain order (and you may need to talk to Boot first before accessing the dungeon too). Go to the north wall and pull the lever there so it is up. Now go into the south room and pull that lever up. Now go back to the north wall and pull its lever down. You can now enter the north room to pull that lever up. Proceed outside to pull the lever on the north wall up. Go into the south room again to pull that lever down. You now have access to the cage where the hellhounds are. An example of a suggested inventory and equipment is below. 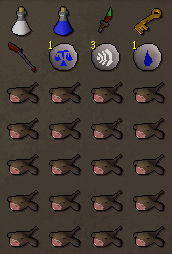 This is a suggested inventory for melee'ers wishing to fight the hellhounds in this dungeon. The DDS is of course, optional (I like to use its special when I get a full special bar just for the fun of it). The law and water runes for Ardougne teleport are of course optional if you don't have the level (51 Magic) or if you don't have enough law runes. Lobsters or better are suggested, but Tuna or cakes would be alright (cakes are convenient as you can steal them in Ardougne). This equipment is a very loose guideline, depending on your level you may have better/worse armour/weapons. This is a good example for what to wear for mid-level 80's, however. The strategy here is very simple: kill the Hellhounds in the caged area until you're out of food. Then just leave the dungeon, restock on food and head back for more slaying if you'd like. 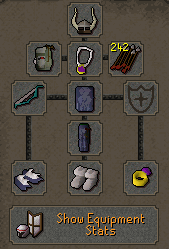 Often times, when you receive a clue scroll from a Hellhound, it will be a level 3 clue which yields rewards such as the various god armors, trimmed armors, and Enchanted Robes, among others. 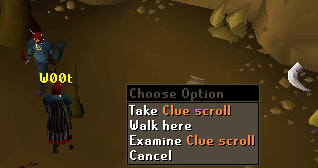 Obviously, these clue scrolls are quite rewarding, and it is worth doing the Treasure Trail. Be forewarned though, that most of the time you'll need to face a level 108 Saradomin Wizard or a level 60 Zamorak Wizard, both of whom use powerful magic. The Protect From Magic Prayer is useful against the Zamorak Wizard. For the Saradomin Wizard, it's best to attack him first, run away (just outside of his melee attack zone), turn on your Protect From Magic Prayer and range him.